Where do I use my Specky Four Eyes voucher code? 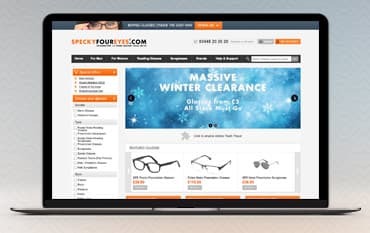 Find a Deal you wish to use at Specky Four Eyes from NetVoucherCodes. Copy the code if given then head over to the homepage via the link provided. Browse for products which suit you, personalise your design, pick the right pair of frames or select your lens transition options and prescription if necessary. Once you’re finished shopping, head over to the checkout. Paste your code into the field provided and click ‘Apply’. Your discount will be applied. Follow the next steps to complete your payment. Using a discount code is a great way to save money on your order. Specky Four Eyes offer regular voucher codes. Some will give you a discount on specified items such as "Save a Huge £71 off Marc Jacob products " or "Get a £10 discount on Oasis Prescription Glasses" or sometimes they offer money off all orders like "5% saving on your order". You just need to enter the discount code at the checkout stage to see an instant reduction to your final bill. Here at Netvouchercodes, we aim to keep you updated on all of the discount codes and money saving deals that are on offer at Specky Four Eyes, so be sure to check here before placing your next order. At Specky Four Eyes you'll find regular Flash sales that will offer you even more money off the already discounted prices that are always on offer. They usually consist of amazing deals on select brands such as "£10 Henleys glasses" or "£10 Converse glasses". You will also find great deals on branded glasses cases and prescription sunglasses. These Flash deals are exactly as described- they are gone in a flash, so, if you see something you like, don't delay and order them quickly before they are all gone. You should also be aware that because these offers are so good and demand is great your order might take as long as between 10 and 30 working days to complete, but these offers are such good value that they have to be worth waiting for. Take good care of your eyes by wearing your prescription glasses regularly and wear sunglasses from the harsh sunlight. Get your frames and great designs of sunglasses through Specky Four Eyes. This also houses some of your favourite designer brands. In the Special Offers section of the Specky Four Eyes website, there is some great money saving deals. Here you'll find all the Flash Sales, the special offers on New Arrivals, the Frame of the Week offer, sales on Reading Glasses and the Everything Must Go sale, where you'll discover great deals on glasses frames, sunglasses and accessories like branded cleaning cloths and branded glasses cases. These offers will save you £££s on the already discounted prices that are on offer at Specky Four Eyes and are not to be missed. These amazing offers won't be around for long so make sure you grab yourself a bargain while you can. What are your delivery details? We aim to send orders out within 3 to 30 days of receiving your order and prescription. Some orders can take longer due to prescription complexities or coating combinations. Specky Four Eyes is one of the UK's fastest growing retailers of prescription glasses and sunglasses online. Here you'll find frames for men, women and children from all your favourite designer brands including Prada, Ted Baker, Dolce and Gabbana, Ray Bam, Converse, Diesel and many more, all offered at prices of up to 80% less than those you'll find on the High Street. Shop with one of our vouchers to save yourself even more money on your order.